Garage Hachi: Some Comfort !!?! 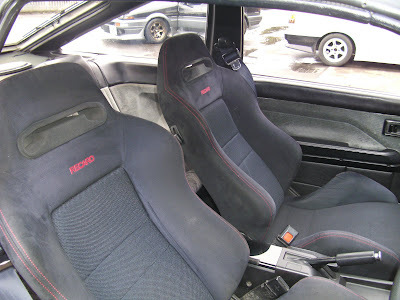 One the first jobs I tackled on my Levin was the interior. 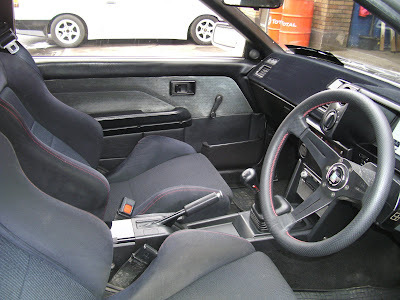 When I got it first it had a bolt in cage, a cracked red dash top, no rear seats, mismatched front seats and was missing some interior plastics. This wasn't gonna cut it for my new daily slider!! The first thing I picked up was a black GT-Apex grade interior minus the front seats. After I had that all cleaned up and fitted, I decided to get a good dash top flocked, just to be different and to stop any glare on the screen on the off chance of a sunny day lol..
Ronan from ROCO, we made up some custom adjustable rails and in they went!! After that I just fitted my TRD knob to the TRD short shifter, and fitted my brand new 350x80mm "deep cone" Nardi Torino wheel. 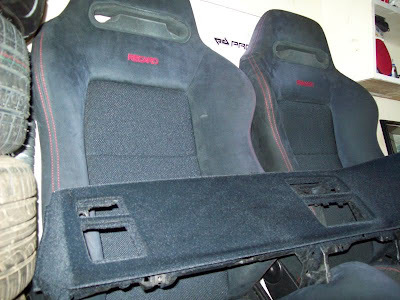 Roj andI also made up a back shelf to take a pair of decent speakers and covered it with black material. The white SK engineering dials read up to 200km/h and came in the car from the motherland!!! 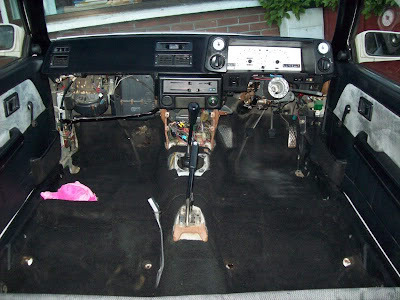 Other than a set of black floormats and a spin turn knob on the handbrake, thats about all the mods I've done so far on the inside!!!!!!!! !